1. Use a wider, shallower pot rather than a tall and narrow one. The increased surface area will let the water heat up more quickly. 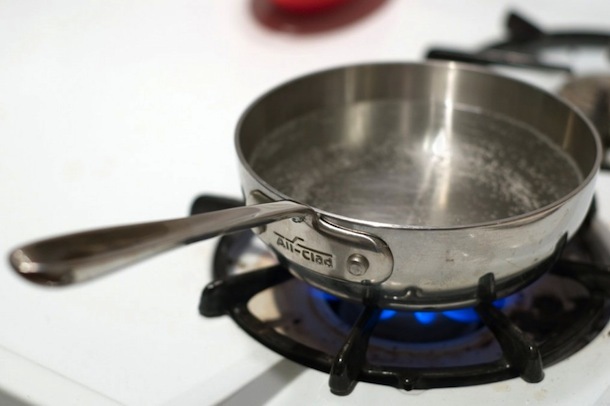 A thinner pot will also boil quicker than a very thick one. 2. Start with hot water. Fill your pot with hot tap water, rather than cold. It'll give you a jump start and get you to the boiling stage about 1 1/2 to 2 minutes quicker, depending on the amount of water in your pot. NOTE: this is not recommended in homes with older pipes as the hot water can leach lead and other funky stuff into the water. Use your judgement. 3. Only use the amount of water that you really need. If you're just boiling a couple eggs or potatoes, there is no need to use a large stockpot. Many vegetables are actually better steamed with just an inch or two of water in the pan, rather than a full boil. 4. Cover your pot. This traps the heat and speeds up the process. Just use a plate if the pot you're using doesn't have a lid. Bonus Tip! Reuse your boiled water--blanch some veggies in the pasta water after you've fished out the pasta, or hard boil a few eggs for tomorrow's breakfast. You've already used up the water and the energy, you might as well take advantage! Like this post? Share it with a friend on Facebook or Pinterest so that more folks can see it. I'd also love if you'd consider subscribing to my newsletter, follow me on Twitter, become a fan on Facebook, or sign up to receive my once-a-week e-mail updates by filling in your address in the box on the right. If you're in the NYC area, be sure to check out my NYC dinner party style cooking classes. Thanks for reading & sharing!